← Should Book Stores Charge for Author Events? Rare books are like works of art. Browsers at the Twin Cities Antiquarian Book Fair. No matter how much you love your e-reader, the books it contains will never look beautiful on your shelves and those electronic books will never appreciate in value. You’ll never feel the weight or the texture of digital books, the care that went into binding them or wonder who held those books before you. Those facts were particularly striking last weekend as I strolled the stalls of the 21st annual Twin Cities Antiquarian and Rare Book Fair at the Minnesota State Fairgrounds. The shelves were full of lovely leather-bound, gold embossed rare books as well as first editions from the likes of Ernest Hemingway, William Faulkner, Ray Bradbury and scads of others. Picking them up was like holding a piece of literary history. I kept waiting for someone to slap my hands and say, “You touch it, you buy it,” but no one did. One of the marquee items for sale was a first edition of F. Scott Fitzgerald’s Tender Is the Night, which probably sold for a buck or two in the 1920s, but was listed on Saturday for $35,000. I have rare-book taste but a garage-sale-paperback budget, so Tender is the Night wasn’t among my purchases. Nonetheless, there were more affordable options including books for as little as $5. But the real fun for me was to be among people who are even more book-obsessed than I am. These are not the same people you would find at, say, the Pet-a-Palooza that was going on in the building next door. (That looked like a lot of fun, too.) It was a crowd that might be described as “professorial.” I ran into a friend who said he was sure he was the only guy there without a beard. Though they deal in valuable volumes, the booksellers at these events are a friendly bunch and happy to discuss the business (which is doing pretty well) and share their tips on collecting books and spotting first editions. Original dust jackets are a must, signed by the author. 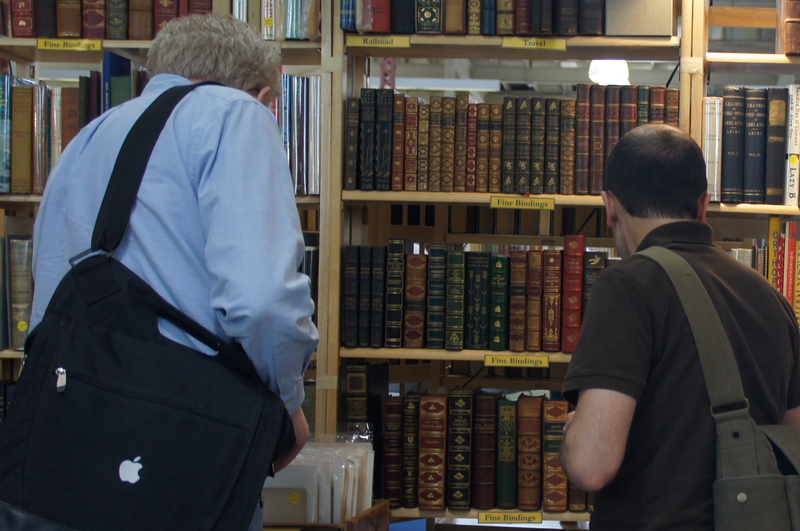 I lingered and lurked around the desk where dealers where appraising books that people brought in; it was like watching “Antiques Roadshow,” only for books. Who knew a book fair could have such drama? One woman hauled in a pile of books that looked like they had been in her attic since the 30’s and she was more than a little distressed to find they were worth about $5 max (the agony of defeat!). Another gentleman who brought his books in a briefcase as if he were delivering ransom money walked away a happy man with the knowledge that several of his tomes were worth a few hundred dollars (the thrill of victory! )—with dust jackets and signatures, of course. As e-readers continue to grow in popularity, rare books will only become rarer, but I’m hoping they won’t become nearly worthless like old PCs or film cameras, but rather more like valuable Chippendale furniture. For more on the world of antique and collectible books, check out the International League of Antiquarian Booksellers. And, if you’re looking for a book fair to attend, the The Midwest Antiquarian Booksellers holds their big Chicago show in August. This entry was posted in Minneapolis/St. Paul and tagged antiquarian books, book fair, e-readers, rare books, reading. Bookmark the permalink.